Excuse me, this book has a hare in it. 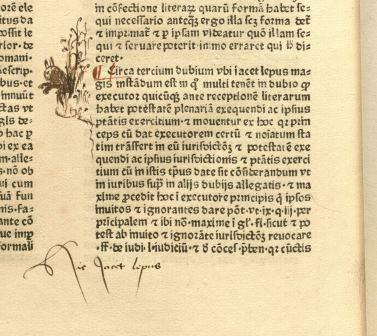 Part of the fun in dealing with older materials is coming across the occasional doodle or illustration added to the margins. This charming little creature comes from Decisiones antiquae et novae Rotae romanae (Old and new decisions of the Roman Rota), edited by Wilhelm Horboch sometime in the late 14th century, though our edition was printed around 1477.
Who knew rabbits were so handy? Among the Kuttner Institute materials recently deposited here are two pieces indicative of the work the Institute continues to support – creating editions of Medieval Canon Law. 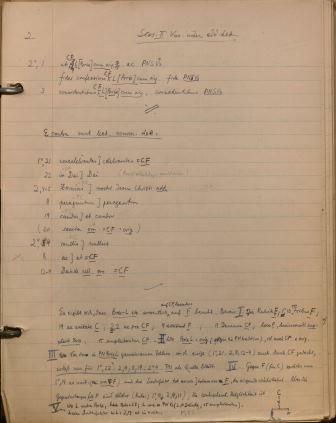 The first picture, a page from a notebook used by Stephan Kuttner, shows his notes on variant readings found in texts of the Council of Trent (1545-1563), and they occupy the top half of the page. The bottom half has his thoughts regarding which of the texts he consulted served as the source for the other texts, visually expressed by the tree in the bottom right corner of the page. This second picture demonstrates another method of tracking variant readings. A scholar working on Pseudo-Isidore used sheets of graph paper (taped together to form pages of over three-and-a-half feet in length) to list changes between manuscripts line by line. Painstaking labor with a rather cumbersome physical result, but still a good way to see copy errors and textual corruption at work. More than 40 items, all from the Yale Law Library’s collection, depict the origins of the Commentaries, its remarkable success as a textbook, and its impact on both legal and popular culture. 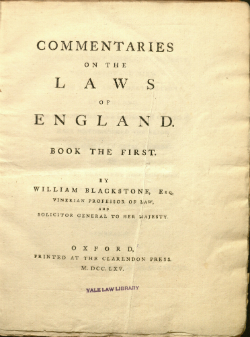 The items include a volume annotated by one of Blackstone’s students, a legal treatise with Blackstone’s own handwritten marginalia, the first English editions of the Commentaries, early Irish and American pirated editions, abridgments, teaching aids, student manuscripts, critiques, translations (into French, German, Italian, and Chinese), and a 1963 liquor advertisement. The exhibition is curated by Wilfrid Prest and Michael Widener. Prest, Professor Emeritus of History and Law at the University of Adelaide, is the author of William Blackstone: Law and Letters in the Eighteenth Century (Oxford University Press, 2008), the definitive biography of Blackstone, and numerous other works on Blackstone. Widener is the Rare Book Librarian at the Lillian Goldman Law Library, Yale Law School, and is on the faculty of the Rare Book School, University of Virginia. The exhibition is on display through June 2, 2015, in the Rare Book Exhibition Gallery, located on Level L2 of the Lillian Goldman Law Library, Yale Law School (127 Wall Street, New Haven, CT). The exhibition will then travel to London, where it will be on view September through November 2015 at the library of the Honourable Society of the Middle Temple, which was Blackstone’s Inn of Court. From December 2015 to February 2016 it will be at the Sir John Salmond Law Library, University of Adelaide. In conjunction with the exhibition, the Yale Law Library will host a talk on April 17 by Cristina Martinez of Carleton University, who contributed “Blackstone as Draughtsman: Picturing the Law” to the collection edited by Prest, Re-Interpreting Blackstone’s Commentaries (2014). Her talk will be accompanied by Mark Weiner’s video, “Blackstone Goes Hollywood,” which includes an interview with Prest. A catalogue of the exhibition will be published, with the generous support of William S. Hein & Co. Forget little bottles of bubbles or bags of candy, couples getting married in early-modern Germany printed books to celebrate the wedding. This interesting piece, a poem likely from such a book, comes to us as part of the binding for a volume of two commentaries on Roman law published in Lyon in 1590. The sheet with the poem is simply the top of the many sheets of paper pasted together to form the board for the back cover (appropriately called ‘pasteboard’). It is only visible because the paste-down, paper that would normally cover the folded edges of the leather binding, is missing. The binding is alum-tawed skin with blind stamping and rolls, that is, the same style seen in the Reflections on Bindings Exhibit, making it contemporary to the printing. 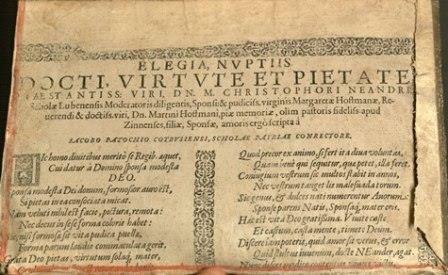 This is an important detail in trying to find information about the poem, since the inscription on the front, dated to February, 1676, could lead one to think that the book was bound on that occasion and so hamper investigation. All of the towns listed are in what is now eastern Germany (mostly south and east of Berlin). Tracking the people named proves harder – only the groom appears to have left a trace. He may be the Christoph Neander who served as a professor of Moral Philosophy at the University of Frankfurt (Oder) in the early 1600s. However, the scanty evidence prevents any firm identification. As mentioned above, writing and publishing books celebrating a couple’s marriage was a common practice in early-modern Germany. Martin-Luther-Universität Halle-Wittenberg has a robust digital collection of 16th-18th century prints, and searching “nuptial” and then filtering for wedding books (Gelegenheitsschrift:Hochzeit) gives a sense of how wide-spread the practice was. Christoph and Margaret were in good company, but apparently printed too many copies, so that Jacob’s poem wound up in the scrap heap, and then on our shelves.